harp multihost is like harp server on steroids. This is the best way to serve multiple sites in the same folder, with a single command. It’s important to stay organised while working on multiple projects. Spinning up many servers on different ports is for the birds. Multihost provides all the same benefits, and more. port - (Number) Optional, The port the server listens on. Defaults to port 9000.
help - Display additional help on harp multihost. path - (String) Optional, The path you want your server to listen to. 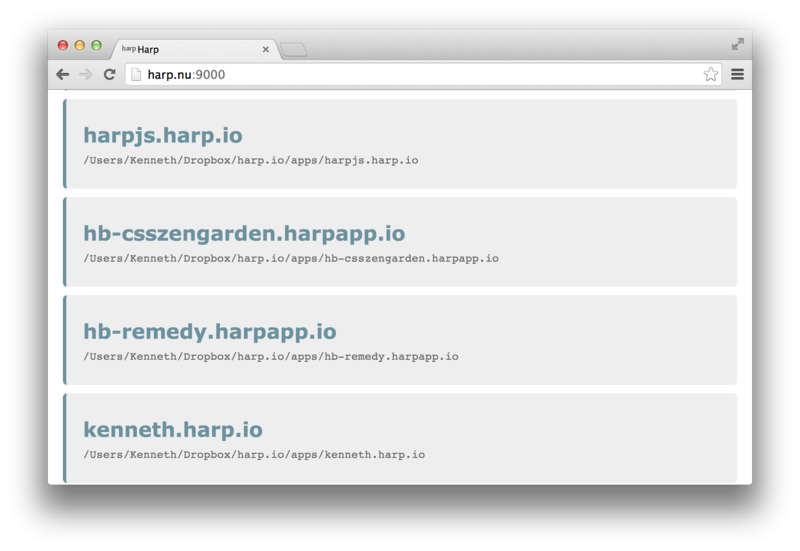 Harp also maps http://127.0.0.1 to http://harp.nu, so you can visit your multiple applications locally. Each one will also be available at a subdomain of harp.nu. If you’d like this local URL to have parity with your deployment URL, you can use the Harp Platform and also have your deployed applications available at a subdomain of harp.io. Note this will not work if your machine is offline, as you will not be able to reach http://harp.nu. As with harp server, by specifying an environment variable, you can multihost in production rather than development mode. In production mode, Harp has extra LRU caching to make your site run even faster. It’s possible to run harp multihost on port 80, making it easy to leave a folder of applications hosted for you at all times. The & should allow you to continue using this instance of your command line. If you are on Windows, you may leave off sudo, but you will still need administrative privileges. If you need to end multihost on port 80 (or anything else for that matter), find how to respolve port conflicts.